Having said in my last post over a month ago that I would write a blog about the rest of half term with the grandchildren, time eluded me! A lot has happened since then. I went to the National Trust property at Baddesley Clinton (Lapworth) with our daughter in law, Molly, Noah and Evelyn. We have all been before and it is a place I will go back to again and again. The children enjoyed the pumpkin trail and I found gourds I did not know even existed. Outside they have small rakes and big plastic 'hands' to encourage children to collect fallen leaves! They love it and 'fight' over who has the rakes! I wish I could find the same enthusiasm for leaf clearance at home! I took Jaq here earlier this year - I particularly remembered her when we were in the library - this time the volunteer pointed out a book that was around a long time before JK Rowling's version! 4th from the left - The Philosopher's Stone. There is a good turn out round here of ghosts and other weird creatures and I have to say they have never caused any trouble and only call at houses that are suitably decorated. As we had George and Jamie to stay for a few days the first thing to do today was pumpkin carving. and headed out to join the fun! Chris and I took the boys to The Black Country Museum - a return visit for me, but a first for Chris. We had a great day out. Our first port of call was to the mine - something I did not do last time I visited. We were determined to get ahead of the queue. It was well worth the 15 minute wait and something I would highly recommend. There is a lot to see and do and I am sure it is somewhere a lot of you have been. The lesson in the classroom was good, but the 'teacher' was not quite as strict as the one I had last time I went. and with the ball and cup which is fearsomely difficult - I am sure there is a knack, but I only succeeded once, which was once more than anyone else!! The boat trips into Dudley tunnel end on 31 October for the winter, so we will have to go back with the boys as it was a trip worth taking. One day we will manage to moor our own boat and pay another visit. We went back to the place we rented last November in Furnace, Mid Wales to catch up with Chris' Welsh family. Sadly there were two less than when we visited last year, but both were a good age and had had long and happy lives. On a positive note there were two brand new members to greet (and cuddle!). Chris' cousin's daughter and son had little girls who were 4 weeks and 1 week old when we arrived. The cycle of life. We caught up with everyone and also enjoyed three good beach walks even though we nearly got blown away on the first Saturday. Ynsylas is dog heaven - just miles of almost deserted beach at this time of year. There were two new notices we have not seen on our many visits (my first time there would have been in the early 1970's!). As parking is on the beach it is wise to take notice! and finally - we guess that someone must have hopped back to their car! It does seem to be an odd thing to have left behind! We went straight from Wales to stay with our friends in Staffordshire - they are the owners of black Labrador, Kiera, who comes boating with us occasionally. We lunched out together on the Thursday and on Friday, Chris and I left Monty with them whilst we went to Nantwich to see Jaq on nb Valerie. It is always great to see her, but even more so after the news that she is selling up and going back to the States. A hard decision, but we wish her well. To see details of nb Valerie - have a look here. We did a round trip of marinas in the area delivering & collecting things and finally to have lunch at Overwater Marina. It was really good to see Jaq. 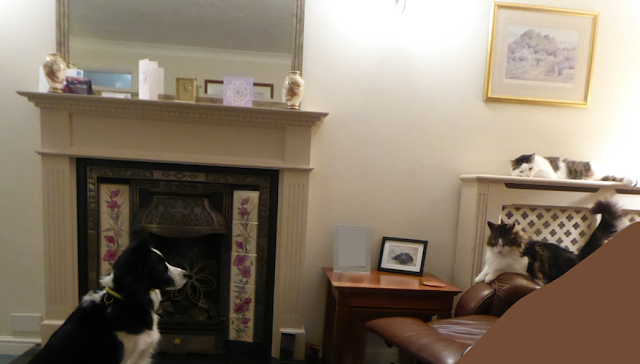 Whilst staying with our friends, Monty not only has Kiera to amuse him, but two cats as well. He is fascinated by them, but does not seem to understand what they are about. He means them no harm and is often close, however he has yet to learn they don't like having their bottoms smelt!! If they are in the sitting room he just sits and stares. He occasionally moves closer until he is growled at by Henry (on the chair) or hissed at by Guiness ((the boss)on the radiator)). They have both swiped at his nose with their paws, but always with claws in. He spent almost six weeks with them in 2016, so you would have thought that he might have learnt to ignore them, but no! you find Guiness in residence!! On Saturday we visited Shugborough Hall with our friends. It was a first for us and one I am sure will be repeated as it was a fascinating place made all the more appealing with the many Christmas trees on display. In 1624 it was purchased by William Anson who was a descendant of the Earls of Lichfield. When the 4th Earl died in 1960 it was passed to the National Trust in lieu of death duties with the 5th Earl, Patrick Anson (known as Patrick Lichfield in his professional life) being allowed to use a few rooms for a reduced rent for the remainder of his life. A couple of these were open to the public, but no photography is allowed in there. Patrick's name appears several times on the height chart of many generations of Ansons to be found on a door of one of the rooms. Most of the exhibits around the house chart the lives of Thomas (1695-1773) and George (1697-1762). Thomas was responsible for extending the house - when he inherited it there was just the central portion with the seven windows. He was also responsible for purchasing the many treasures on his travels round Europe and sometimes further afield. The money was raised by his brother George who was in the Navy (he rose to be the First Lord of the Admiralty). He captured a Spanish treasure ship and took his riches back home to be invested in the estate. There is so much to see and almost impossible to decide what to show, but this is a small taster to whet your appetite. We had started the tour 'below stairs' and that was as fascinating as the house itself. It was there that we learnt that the dining room is at the far side of the house away from the servants quarters - a good 10 minute walk, so ensuring they got hot food was always an issue. Again just a small taster of what there is to see. but it was the French Chef who ruled the roost. He cooked for the family and guests, whilst the rest of the kitchen staff looked after all the servants and farm hands. French chefs were highly prized and were a sign of your affluence and influence. and this explains all - I think I will stick to the automatic washing machine, thank you! Apparently valuables were kept in this cupboard (and the one on the other side of the range) - the butler kept the ladder, so there was no chance of things going walk about! Access can be made from the moorings at Great Haywood and we would definitely recommend a day here to explore. The next day it was back home to face the chaos! 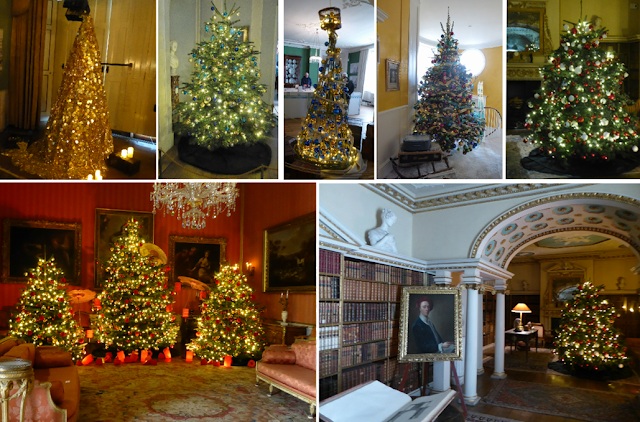 We have a decorator in who arrived on 12th November and he is making his way through most of the house. We have always done our own decorating in the past, but it is something that is just not possible for us any more. I am suffering enough with an asthma cough just having the paint on the walls, never mind getting up close and personal. I have to say he is extremely thorough and the neatest workman I have come across in a very long time. Every night he folds all his dustsheets up into a perfect pile and even hoovers before he goes home - the place is cleaner when he leaves than when he arrives. All but my 'craft room/study' (also a spare bedroom) and Chris' study will be done before Christmas. Thankfully we have a quiet Christmas 'a deux' as we both need to empty our rooms for decoration from 3 January. I also have the challenge of getting rid of enough 'stuff' to free up space currently occupied by large bookcases to allow us to erect bunk beds. It will happen and I will be ruthless - well if I keep telling myself that, I might be right!! For many years I have made hand crafted greetings cards and I know I have a lot of 'stuff' I will never need again, so it has to go! One of our spare rooms has been gutted (the old furniture was very old and very brown) and new Ikea white wardrobes have arrived which Chris has built. The carpet was replaced there last Tuesday and today a new carpet arrives for the other spare room. It really is chaotic, but it will be worth it. Once our studies are done all the really cheap acrylic carpet that was in the house when we moved in 7 years ago will be gone. The biggest issue with it is that it hangs on to the dog hair and won't let go!! Well that is it from me for this year - I hope you all have a wonderful Christmas and we both wish you all the best for 2019 and hope to bump into a few of you (not literally, though !) during our 2019 cruising season.